It takes good planning to craft a good sales compensation plan that rewards growth , pays for itself and meets the companies goal of not paying too much. Motivating Salespeople is more that just throwing more money at them to grow sales. It takes a well crafted plan. Jeremy said that “Without a plan…. Any plan will do.” Without a good compensation plan your best sales people … Leave the company. Managements goal is to grow Profitable Sales that will drive up Revenue, simple as that seems many plans only promote Gross Sales some of which may not be all that profitable for the the Company but result in fat commissions paid to the Salesperson. The good news is, Bonuses Are Back ! Compensation is up. The days of low balling employees think the depths of the recession 2008 – 2009 are gone! Corp incentive plans are ratcheting up performance goals, as well. A salesperson must hit 95% of Goal to get a shot at the real money. Thanks to CRM Systems like Salesforce management can measure performance like never before. As a result, there are more performance metrics than in the past. 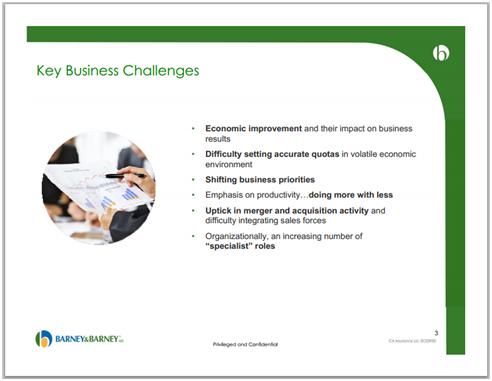 The focus is profitability. Full commission only sales plans work in some models culturally and not in others. This was a trend during the recession but that has changed. Setting up the pay mix of Base, Draw, and commission can be tricky. 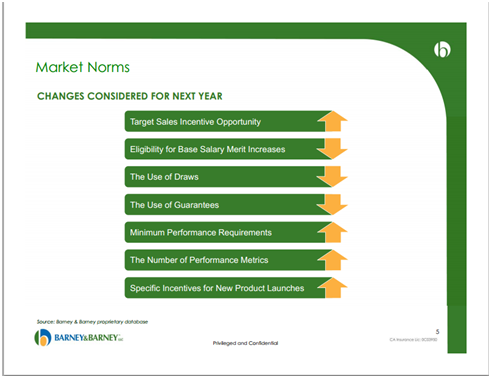 Boards have become more interested in what and how the Sales Compensation Plan is set up. They want to know how it works and what does it reward. They want to know the plan cost verses percent of revenue it generates. They also pay attention to the slope of the pay curve, is it long and gently rising or does it pitch up at some point like a hockey stick. At the start of the day does your sales team know that they have already earned 90% of their commission just because they woke up ? Or do they know they have that they must run all day to earn the other 50% of their compensation. One plan will get your sales team to hustle the other will get you a bunch of order takers. The better plans mix base, commission and bonus. 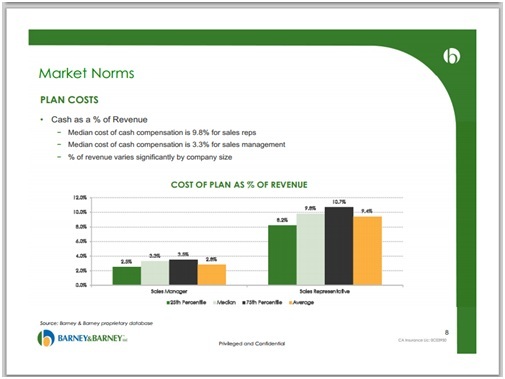 The Cost is typically 8 to 10% of the revenue they generate. The Sales manager’s compensation ranges between 2.5-3.5% of the team they manage. More good news few companies cap compensation plans any more. A good plan must be structured properly to generate the final numbers. A company should love a Sales Rep who is hitting it out of the park and making more money than the CEO. My recent experience in the market reflects Jeremy’s, I am seeing an upswing in hiring and wages are trending up. This is good news for those looking to move or who are in transition. Our Presenter today is: Jeremy Anderson Principal at Barney & Barney Co. Joined Barney & Barney in 2010, oversees the Compensation Consulting Practice. He and His team offer clients a specialized level of expertise in the area of executive pay, equity strategy design and sales force compensation. 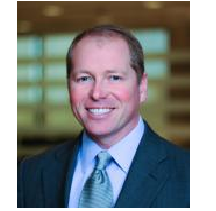 His experience includes the design and implementation of sales compensation programs, equity strategies, base pay structures, short-term incentives and performance management systems. He has focused on firms in the life science and technology sectors. Prior to joining Barney & Barney he was a consulting principal at Remedy Compensation Consultant, Top Five Data Services, IQuantic and a Senior Consultant in Arthur Andersons Human Capital Service practice. Jeremy serves on the Board of Volunteers of America South West California. This entry was posted in CA, CRM, Marketing, Orange County, Phil Sallaway, Salesforce, Salesforce CRM and tagged Sales, Sales Compensation, Sales Leadership Alliance. Bookmark the permalink.